Seer is a Canadian post-doom project by Bronson Lee Norton on vocals and acoustic guitar, Madison Norton on drums and percussion, Josh Campbell on bass and slide acoustic guitar, and Kyle Tavares on electric and acoustic guitar, percussion, and vocals. Together, their slow, nearly funereal, doom metal shines a light darker than a black nail polish factory on a moonless night. Their first EP, simply called Vol. 1, was a nice blueprint to their latest release, Vol. 2, and both are provided below on the band's Bandcamp. "Cosmic Ghost" kicks off the EP with beautiful violin by additional musician Madeleine Gawthrop, who also provides backing vocals. And, frankly, the snail-paced time structures, along with peppered-in drums and acoustic guitars, make early Black Sabbath seem peppy by contrast. 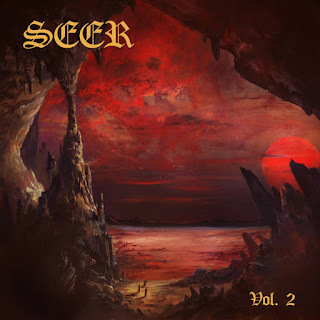 The whole track crawls along into "Haunter", which continues the slow doom bleeding with intensity nicely accompanied this time by Danielle Howell on backing vocals and a righteous melted guitar solo by Royce Whittaker. Nearing the end is a sharp change of tone with venomous blood-curdling screaming. "Antibody" follows with pure hell at every corner, the guitar, vocals and drums belted as we hear the band furiously pummeling their way through. And finally, we have the aptly-titled closer "Aeons". With a welcome return of Danielle Howell, it's a chaotic, almost structureless piece that wouldn't be out of place in an H.P. Lovecraft short story, being played to keep a creature of unbridled horror at bay.